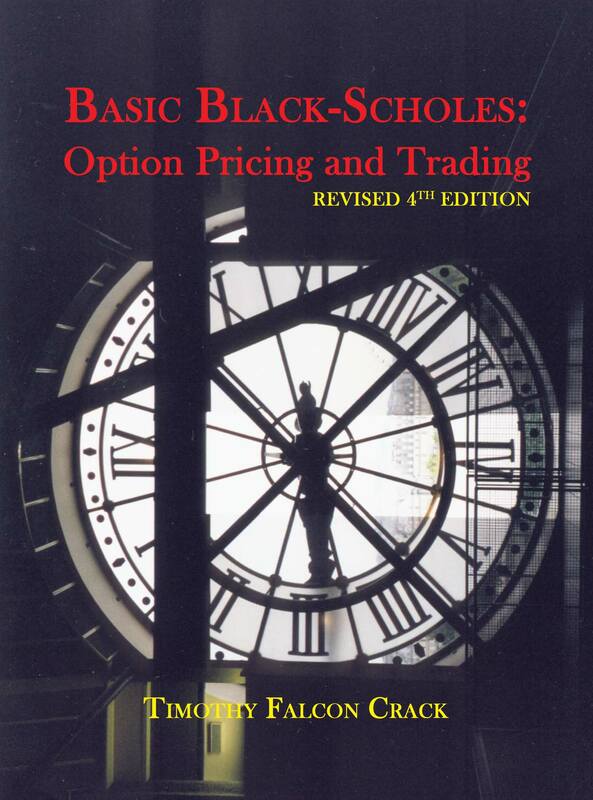 "...a clear explanation of basic option pricing theory, plus option trading advice for the novice"
The revised FOURTH edition (ISBN 978-0-9941386-8-2) is in stock at online stores. This book gives extremely clear explanations of Black-Scholes option pricing theory, and discusses direct applications of the theory to option trading. The explanations do not go far beyond basic Black-Scholes. There are three reasons for this: First, a novice need not go far beyond Black-Scholes to make money in the options markets; Second, all high-level option pricing theory is simply an extension of Black-Scholes theory; and Third, there already exist many books that look far beyond Black-Scholes without first laying the firm foundation given here. The author studied PhD-level option pricing at MIT and Harvard, taught undergraduate and MBA option pricing at Indiana University (winning many teaching awards in the process), and has traded options for over ten years. This special mixture of learning, teaching, and trading is reflected in every page. Basic intuition you need if you are trading options for the first time, or interviewing for an options job. Honest advice about trading: there is no simple way to beat the markets, but if you have skill my advice can help make you money, and if you have no skill but still choose to trade, my advice can reduce your losses. Full immersion treatment of transactions costs (T-costs): e.g., here are the quotes you see on your screen, what should you do to avoid unnecessary T-costs. Passwords for two downloadable spreadsheets. The first spreadsheet allows the user (with a view on a stock) to forecast profits and transactions costs for option positions using simple models that allow for bid-ask spreads, commissions, and the volatility smile. The second spreadsheet allows the user to explore option sensitivities including the Greeks. Careful treatment of how to apply (European-style) Black-Scholes pricing to the trading of (American-style) options on equities. Special attention to intuitive explanations for terms in the Black-Scholes formula. Comparison of leverage through margin trading on stocks to leverage through trading options. Intuitive discussion of continuously-compounded returns. Introduction of the notion of "paratrading" (trading stocks side-by-side with options to generate additional profit). Unique "regrets" treatment of early exercise decisions and trade-offs for American-style calls and puts. Unique discussion/illustrations of the implications of put-call parity for option pricing. How to calculate Black-Scholes in your head in 10 seconds. Special treatment of arithmetic Brownian motion, including general pricing formulae and comparison to Bachelier and Black-Scholes. The third edition includes practitioner Bloomberg terminal screens used to explain key concepts. Careful attention to the impact of dividends in analytical American option pricing. Black-Scholes option pricing code for the HP17B, HP19B, and HP12C. Discussions of lessons from trading in terms you can understand. Intuitive treatment of high-level topics like the traditional bond-numeraire interpretation of Black-Scholes (where N(d2) is P*(ITM)) versus the alternative stock-numeraire interpretation of Black-Scholes (where N(d1) is P**(ITM)). Including rewriting the Black-Scholes formula under both measures. Careful discussion of dimensional analysis and the adequation formula (relating FX call and FX put prices through transformed Black-Scholes formulae). Careful intuitive review of risk-neutral pricing/probabilities and how and why these are related to physical pricing/probabilities. Simple discussion of Monte-Carlo methods in science and option pricing. Intuitive interpretations of the Black-Scholes PDE and implications for trading. Careful discussion of conditional probabilities as they relate to Black-Scholes. A compilation of stylized facts about the markets that will help you to trade (e.g., how to profit from reversals, when are T-costs highest, implications of the market for corporate control, ...). This book may be used as a text or text supplement at the advanced undergrad or masters level. It can also be used as a supplement at the PhD level by students who need to better understand fundamental option pricing theory and options markets. The book can also be used by anyone who has a basic understanding of options and wants to trade them for the first time. The trading advice is meant for the novice, but may be useful to more experienced traders. The trading advice does not go far beyond elementary call and put positions because more complex trades are simply combinations of these. Dr. Timothy Falcon Crack did PhD coursework at MIT and Harvard, and graduated with a PhD in Financial Economics from MIT. He has degrees in Mathematics (with a lot of Statistics), Finance, and Financial Economics and a diploma in Accounting/Finance. He also holds the Investment Management Certificate from the UK Society of Investment Professionals. He has won six university teaching awards and been nominated for at least five others. "How to Ace Your Business Finance Class"
"Basic Black-Scholes: Option Pricing and Trading"
"Foundations for Scientific Investing: Test Questions"
Dr. Crack taught at the university level from 1985 to 2000, and again from 2004 onwards, including four years as a front line teaching assistant for MBA students at MIT, and five years teaching undergraduate, MBA and PhD courses at Indiana University's Kelley School of Business. He is now a chaired full professor of Finance at the oldest university in New Zealand. Dr. Crack has worked as an independent consultant to the New York Stock Exchange and to a foreign government body investigating wrong doing in the financial markets. His most recent practitioner job was as the head of quantitative active equity research for the UK and Continental Europe in the London office of what was the world's largest institutional asset manager. Click here to be directed to the latest edition(s) for sale at Amazon.com and Amazon.co.uk (as part of a list containing every book I have written plus some other favorites). LEFT click and choose "Save." Choose "enable macros." The password is in Section 10.3 of the book. EXCEL Spreadsheet Trading Tool (140.8KB), or EXCEL5/95 version (92.7KB). Ask the author a question timcrack@alum.mit.edu.NOSPAM (typically a one- or two-week delay before reply; remove ".NOSPAM" before mailing). Errata (known errors in Basic Black-Scholes). If this book is not what you want, please email the URL to a friend.